On Christmas Eve in 1974, Cyclone Tracy destroyed most of the city of Darwin, with houses ripped apart and families fighting for their lives as they sought shelter. Christmas Day revealed the extent of the damage and, in the days that followed, families were separated as most were evacuated until it was safe to return. While other cyclones and storms have hit Australia before and since, the scale of Cyclone Tracy and the damage she wrought, nothing has matched the scale of that storm – with 71 people killed, 41 000 left homeless and 80 percent of the homes destroyed. 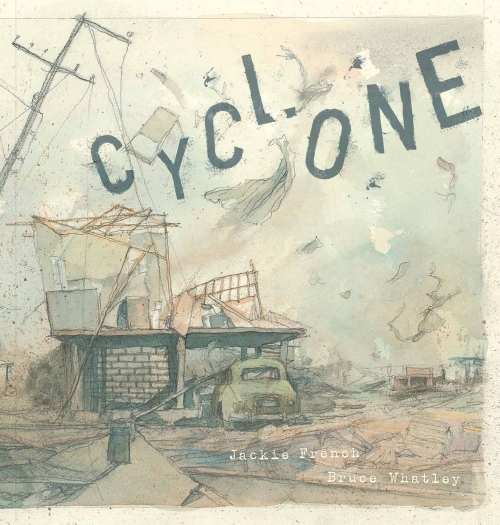 Cyclone tells the story of that night from the perspective of a child who, initially, is sure that nothing is going to spoil Christmas, until s/he is woken in the night by Dad, who ushers his family out of their disintegrating house to hide under their brick barbecue. The rhyming text gathers the momentum of the storm – starting and finishing calmly but with pace and fury in the middle, and the chaos reflected by short line breaks. The illustrations too, match the text with brooding skies in the early spreads, lightening slightly to illuminate the chaos of the storm, then brighter in the pages that follow. The use of muted tones and washes reflects both the tone of events and the photography of the 1970s which was used as reference material. From the team who previously produced Fire and Flood, Cyclone is another outstanding offering. When a sudden storm hits, the animals of the farm are taken by surprise. Far from shelter, they are not sure what to do – but Madge the Cow is very calm, and very brave and she offers shelter – first to Lally the rabbit, then to Robinson the dog, Cackalina the chicken and her excited chicks and, finally, to Spike the echidna. As lightning flashes and thunder booms, Madge not only provides a hiding place for the smaller animals, she also encourages them to sing, to dsitract them from the storm. 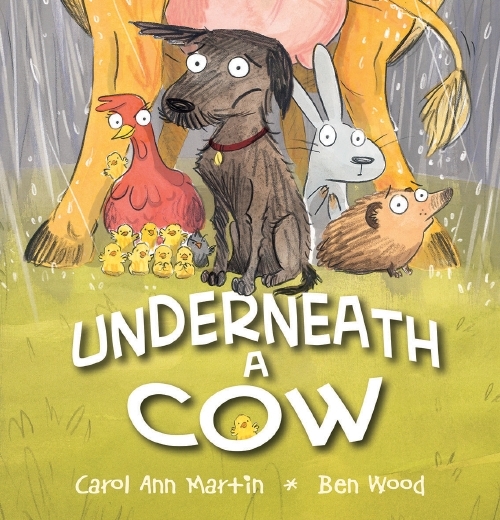 Underneath a Cow is a quietly humorous story about friendship, safety and bravery. Madge is a gorgeous yellow cow who smiles her way through the terrible storm, seemingly happy to be a point of refuge for her diverse range of guests (though she does request that Spike be careful of her ‘dangly bits’). The other animals appreciate her care, and are grateful and even form unlikely friendships through their experience. Young readers will love the silliness of the story and its warm demonstration of friendship, and the humour of the illustrations, rendered in mixed media inluding watercolour, pencil and digital collage. A day at the beach is interrupted by an approaching thunderstorm, and the family rushes home to shelter as the win blows, the rain falls and thunder rumbles. Most of the family dance their way through the storm – echoing what is happening outside – but the viewpoint character, a little girl, is very unsure. While every other family member dances and acts a different part of the storm – rain, wind, thunder, lightning – she waits till the storm has passed to play her own shining role. 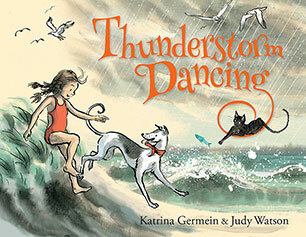 Thunderstorm Dancing is an energetic picture book about thunderstorms, dancing and families. 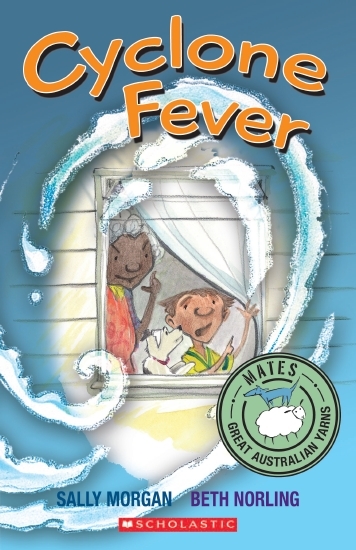 The text makes good use of poetic techniques including onomatopoeia, assonance and rhyme, so that the reader can hear the storm raging and the frenetic movement of the family. The illustrations use a variety of techniques including black ink, pencil and washes to similarly bring to life the movement of the storm as well as the contrast between light and dark. The end papers, with seagulls soaring in the storm inside the front cover and resting on the beach in the back, are a gorgeous touch. Thunderstorm Dancing is an excellent read-aloud offering.